Cross-references in longer Word 2016 documents are very handy indeed. They tell readers where to go to find more information about a topic. You can refer readers to headings, page numbers, footnotes, endnotes, and plain-old paragraphs. And as long you create captions for your cross-references with the Insert Caption button on the References tab, you can also make cross-references to equations, figures, graphs, listings, programs, and tables. The problem with cross-references, however, is that the thing being cross-referenced really has to be there. If you tell readers to go to a heading called “The Cat’s Pajamas” on page 93, and neither the heading nor the page is really there, readers curse and tell you where to go, instead of the other way around. Fortunately for you, Word 2016 lets you know when you make errant cross-references. If you delete the thing that a cross-reference refers to and render the cross-reference invalid, Word tells you about it the next time you update your cross-references. Best of all, if the page number, numbered item, or text that a cross-reference refers to changes, so does the cross-reference. Write the first part of the cross-reference text. For example, you could write To learn more about these cowboys of the pampas, see page and then type a blank space. The blank space separates the word page from the page number in the cross-reference. If you are referring to a heading, write something like For more information, see “. Don’t type a blank space this time because the cross-reference heading text will appear right after the double quotation mark. On the References tab, click the Cross-Reference button. The Cross-Reference dialog box appears, as shown here. Choose what type of item you’re referring to in the Reference Type drop-down list. Make a choice in the Insert Reference To box to refer to text, a page number, or a numbered item. The options in this box are different, depending on what you chose in Step 3. Text: Choose this option (Heading Text, Entire Caption, and so on) to include text in the cross-reference. For example, choose Heading Text if your cross-reference is to a heading. Number: Choose this option to insert a page number or other kind of number, such as a table number, in the cross-reference. 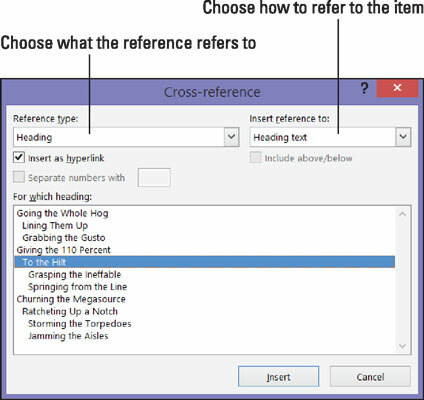 Include Above/Below: Check this box to include the word above or below to tell readers where, in relation to the cross-reference, the thing being referred to is located in your document. If you wish, leave the check mark in the Insert as Hyperlink check box to create a hyperlink as well as a cross-reference. With a hyperlink, someone reading the document onscreen can Ctrl+click the cross-reference and go directly to what it refers to. In the For Which box, tell Word where the thing you’re referring to is located. To do so, select a heading, bookmark, footnote, endnote, equation, figure, graph, or whatnot. In long documents, you almost certainly have to click the scroll bar to find the one you want. Click the Insert button and then click the Close button. Back in your document, enter the rest of the cross-reference text, if necessary. When you finish creating your document, update all the cross-references. To do that, press Ctrl+A to select the entire document. Then press F9 or right-click in the document and choose Update Field on the shortcut menu. If the thing referred to in a cross-reference is no longer in your document, you see Error! Reference source not found where the cross-reference should be. To find cross-reference errors in long documents, look for the word Error! with the Find command (press Ctrl+F). Investigate what went wrong, and repair or delete errant cross-references.